Thai AirAsia is launching four new routes from Chiang Rai in northern Thailand at the end of Jan-2019 and the beginning of Feb-2019. Chiang Rai will become Thai AirAsia’s seventh hub after Bangkok, Chiang Mai, Phuket, Krabi, U-Tapao/Pattaya and Hat Yai. Thai AirAsia is adding three international routes – to Kuala Lumpur, Macau and Singapore – as well as a new domestic service linking Chiang Rai with Phuket. Chiang Rai Airport has a small but fast growing international operation that until now has been limited to mainland China and Hong Kong. The international market accounted for less than 10% of the nearly 3 million passengers handled by Chiang Rai in 2018. Chiang Rai’s traffic has more than quadrupled since 2010, driven mainly by domestic expansion. AirAsia is already the market leader and will widen the gap compared to competitors as it launches the four new routes. Thai AirAsia is launching four new routes from Chiang Rai at the end of January and the beginning of February. Thai AirAsia currently has only two routes at Chiang Rai but is the market leader, with a 23% share of seat capacity. Thai AirAsia plans to start basing aircraft at Chiang Rai, supporting the four new routes and with more new routes likely to follow. Thai AirAsia’s new routes from Chiang Rai to Kuala Lumpur and Singapore will be the airport’s first international routes outside Greater China. Chiang Rai is the seventh largest airport in Thailand based on current seat capacity. It is the smallest of the six airports in the Airport of Thailand portfolio but is one of the fastest growing. Passenger traffic at Chiang Rai has grown at a double digit rate for eight consecutive years. Airports of Thailand has not yet reported traffic for Dec-2018, but through the first 11 months of 2018 Chiang Rai passenger numbers were up by 16%, to 2.6 million. Source: CAPA – Centre for Aviation and Airports of Thailand. Chiang Rai likely ended 2018 with between 2.8 and 2.9 million passengers, consisting of between 2.6 and 2.7 million domestic passengers. Of the 2.587 million passengers handled in the first 11 months of 2018, only 203,000 were international. Chiang Rai’s traffic passenger traffic has more than quadrupled over the past decade. In 2009 and 2010 the airport handled only 700,000 passengers. Chiang Rai did not have any international traffic back in 2009. Chiang Rai Airport has benefitted as Chiang Rai and Thailand’s golden triangle region has emerged as a popular holiday destination for both Thais and overseas visitors. The airport is also the least congested of AoT’s six airports, making it attractive to Thai airlines as they look for potential alternative hubs due to the congestion in Bangkok (Don Mueang and Suvarnabhumi), Phuket and Chiang Mai. Chiang Rai is predominantly a domestic airport, but a large share of its domestic traffic consists of international visitors and the airport has been keen to attract more direct international services. Chiang Rai’s international traffic has grown rapidly over the past two years (although from a very low base) driven by new services to China. Chiang Rai handled approximately 230,000 international passengers in 2018, compared to only 30,000 in 2016. 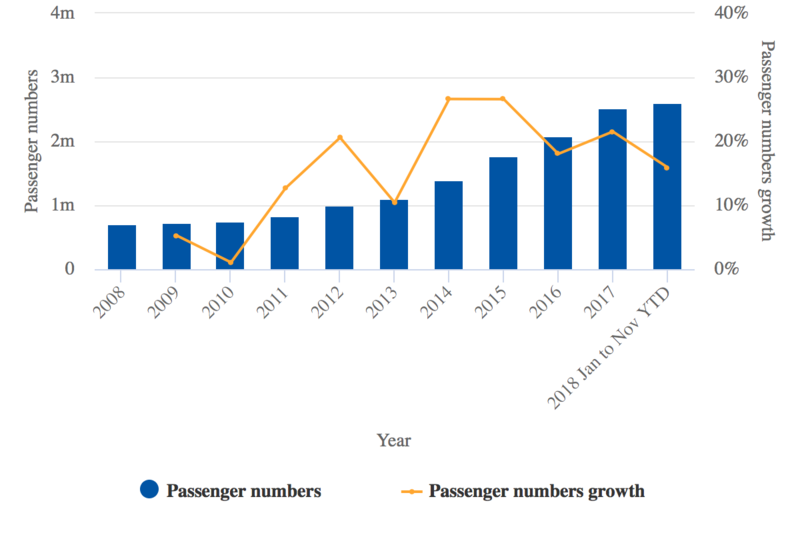 The international market has accounted for approximately 200,000, or 25%, of the 800,000 total additional annual passengers from the past two years. Greater China (including Hong Kong) now accounts for all of Chiang Rai’s international services. Chiang Rai is currently connected with five cities in mainland China and Hong Kong (based on OAG data for the week commencing 14-Jan-2019). The Chiang-Rai-China schedule varies considerably depending on the time of year. However, the general trend has been a large increase in capacity over the past two years as several airlines have entered the Chiang Rai-China market. Two years ago China Eastern was the only airline operating services between Chiang Rai and mainland China. China Eastern began serving Chiang Rai in early 2012. Over the past two years five Chinese airlines have entered the market – Beijing Capital Airlines, Donghai Airlines, Hainan Airlines, Ruili Airlines and Sichuan Airlines – along with Thai Lion Air. China Eastern, Hainan, Ruili and Sichuan each currently operate three weekly flights to Chiang Rai, whereas at the moment Beijing Capital and Donghai do not have any services. China Eastern serves Chiang Rai from Shanghai, Hainan from Shenzhen, Ruili from Jinghong, and Sichuan from Chengdu. Thai Lion currently has four weekly flights from Chiang Rai to Changsha. HK Express has served Chiang Rai from Hong Kong since late 2016 and also currently operates three weekly frequencies. The LCC initially served Chiang Rai with two frequencies and introduced the third flight at the beginning of the current winter season (in late Oct-2018). Chiang Rai’s international passenger traffic could double in 2019 and reach 500,000 passengers. While the mainland China market should experience more growth, most of the growth in 2019 will be generated by the new AirAsia routes to Kuala Lumpur, Macau and Singapore. Kuala Lumpur will initially be served with four weekly flights while Macau and Singapore will initially be served with three weekly flights. Kuala Lumpur and Singapore are particularly significant as they will be Chiang Rai’s first international routes outside Greater China. AirAsia will rely heavily on connections beyond Kuala Lumpur, which is the group's largest hub, whereas Singapore will cater to local point-to-point traffic. Macau is part of Greater China (along with Hong Kong) and will also cater to local traffic. Thai AirAsia will likely add services to mainland China in a subsequent expansion phase, once the new base is up and running. Thai AirAsia has services to mainland China from all its existing bases except Hat Yai. Hat Yai is Thai AirAsia’s smallest base and consists of just one aircraft. Source: CAPA – Centre for Aviation, Thai AirAsia (for aircraft base figures) and OAG (for number of routes and weekly frequencies). Khon Kaen is now Thai AirAsia’s largest destination that does not have an aircraft base. However, Chiang Rai will overtake Khon Kaen (as well as Surat Thani and Udon Thani) after Thai AirAsia launches the four new routes from Chiang Rai. Khon Kaen currently has 58 weekly return flights, compared to 49 for Chiang Rai, Surat Thani and Udon Thani. The four new routes from Chiang Rai will be served with 13 weekly flights combined (four frequencies to Kuala Lumpur and three to Macau, Phuket and Singapore), resulting in a total of 62 weekly flights. With the four new routes Thai AirAsia’s capacity at Chiang Rai will increase by 26%, to more than 22,000 weekly seats. Thai AirAsia’s Chiang Rai operation currently consists of six daily flights (42 weekly frequencies) from Bangkok Don Mueang and one daily flight (seven weekly frequencies) from Hat Yai. Thai AirAsia competes against Bangkok Airways, Nok Air, Thai Lion Air, Thai VietJet and Thai Airways' full service regional subsidiary Thai Smile in the Chiang Rai-Bangkok market, but is the market leader with its 42 weekly frequencies. 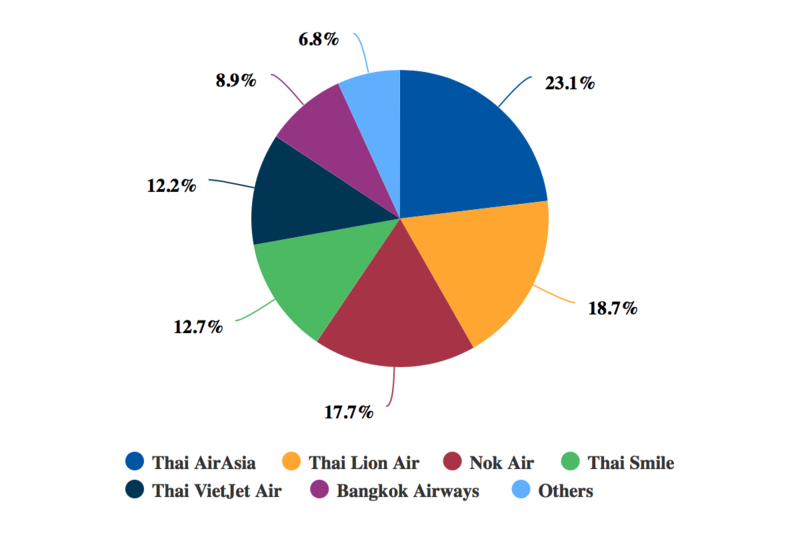 Nok is the second largest competitor, with 36 weekly frequencies, followed by 31 frequencies for Thai Lion, 28 for Thai Smile, 21 for Bangkok Airways and 17 for Thai VietJet (based on OAG schedules for the week commencing 14-Jan-2019). Nok, Thai AirAsia and Thai Lion are based at Bangkok Don Mueang, while Thai Smile/Thai Airways, Bangkok Airways and Thai VietJet are based at Bangkok Suvarnabhumi. Thai AirAsia is the only airline operating between Chiang Rai and Hat Yai and will be the only airline offering nonstop flights on its three new international routes from Chiang Rai. However, it will compete against Thai VietJet on the new Chiang Rai-Phuket route. Thai AirAsia’s capacity share at Chiang Rai will increase from 23% currently to 28% in Feb-2019 due to the four new routes (which are all being launched between 30-Jan-2019 and 1-Feb-2019). Thai Lion is now the second largest airline in the Chiang Rai market by capacity, operating a 19% share, followed by Nok with 18%. In announcing the four new routes for Chiang Rai, Thai AirAsia stated that Chiang Rai would become its seventh hub after Bangkok, Chiang Mai, Phuket, Krabi, U-Tapao/Pattaya and Hat Yai. The airline plans to expand its fleet by four aircraft in 2019, providing an opportunity to open a base at Chiang Rai and further expand its other secondary bases. Thai AirAsia launched several new routes in 2018 from its secondary bases at Chiang Mai, Krabi and U-Tapao bases, in part as a result of infrastructure constraints at Bangkok and Phuket. Thai AirAsia plans to continue expanding at its existing secondary bases in 2019 (along with opening the new base at Chiang Rai), but will also pursue capacity expansion in Bangkok by upgauging to A321s. In 2019 Thai AirAsia plans to take delivery of its first batch of 230-seat A321neos, which will be used to upgauge trunk routes at capacity constrained airports. Thai AirAsia’s current fleet consists of 51 180-seat A320ceos and 11 186-seat A320neos. The airline is projecting a 12% increase in ASKs for 2019, driven by a combination of upgauging at Bangkok, additional aircraft for existing secondary bases, and the opening of Chiang Rai as its seventh base. Establishing the base at Chiang Rai is strategically important for AirAsia as it tries to diversify and reduce its reliance on congested Bangkok. The new base also equips AirAsia for further growth in its already leading share of a fast growing market that has quietly emerged as one of Thailand’s most popular tourist destinations.